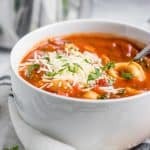 Simple and hearty, this Tomato Tortellini Soup is a great recipe for dinner when you need some good comfort food that will fill you up. 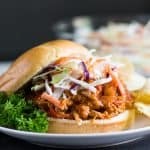 Stove top and Slow cooker variations to fit your need! You know how there are certain things out there that have suddenly become synonymous with “healthy” and then the opposite becomes demonized? Well that is certainly the case with gluten. Over the past several years the term “gluten free” is seen everywhere and it has become the norm that gluten is a big NO-NO if you want to live a healthy, nutritious life. Going gluten free has become the latest health trend, but is it really healthy? If you have a gluten sensitivity or have been diagnosed with celiac, then it is certainly a great idea to avoid gluten. However, according to recent studies, it’s not something that everyone should avoid. It appeared that those individuals who consumed the lowest levels of dietary gluten had a 15 percent higher risk of heart disease,” says study leader Andrew Chan, an associate professor at Harvard. But we have been told that eating gluten free is supposed to be good for our health?? How can this be then?! 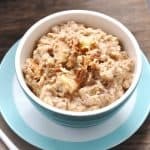 The problem in avoiding gluten for those without a sensitivity or health condition that makes it necessary to skip the wheat is that this means we are missing out on the heart healthy grains that our body needs! But leave it to social media and the world of diet culture to push the message that gluten equals BAD NEWS. Recently I saw a post form someone who does not have a gluten issue and she was promoting a gluten free pizza. She stated something along the lines that she didn’t feel quite as guilty eating more than half a pizza since it was gluten free. What?! But gluten is NOT the enemy. Our ancestors would have died without it, literally. Even white bread can have a place in a healthy diet. What?! Yep, you heard it here. Balance my friends. Don’t give food the power. Don’t make certain foods evil. You are not superior for your food choices just as you are not less of a person for them. So in case you haven’t figured it out by now, today’s recipe features none other than gluten–pasta for that matter! 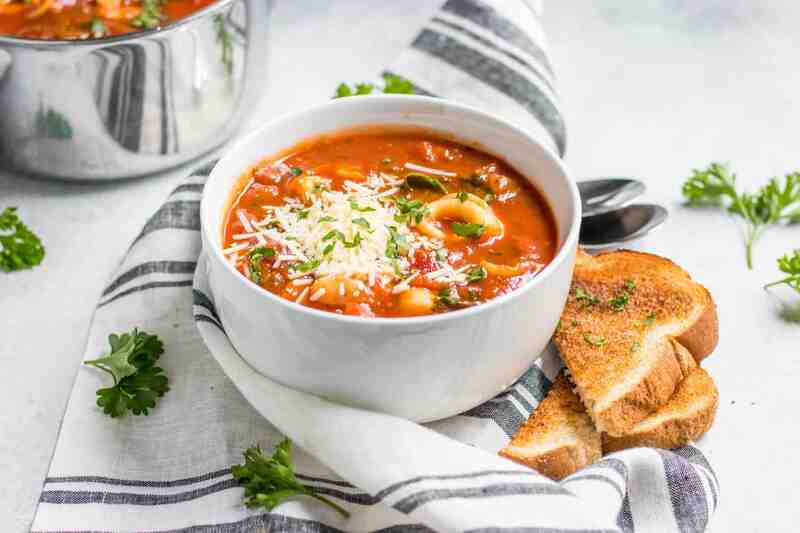 A simple soup recipe that you can slow cook or whip up in no time stove top. We eat tortellini every few weeks but sometimes I get into a rut with how I fix it. As in I just boil it and toss it in sauce. Always. However, this Tomato Tortellini Soup pushed me out of my comfort zone and got me to enjoy the cheesy goodness in a new way. The thing I find to be the best part of this recipe is using a jar of your favorite marinara sauce. This allows you to really make it your own. And you can switch up the type each time you make it! We loooooove Newman’s Sockarooni the most but I have made this also with a spicy marinara and that was fun. The tortellini can also be any flavor you love. Another way to fine tune this one and switch things up every time. We love using a four cheese but a spinach and ricotta or something meaty for Anthony are coming soon to our home. Garlic bread–that goes without saying, right? 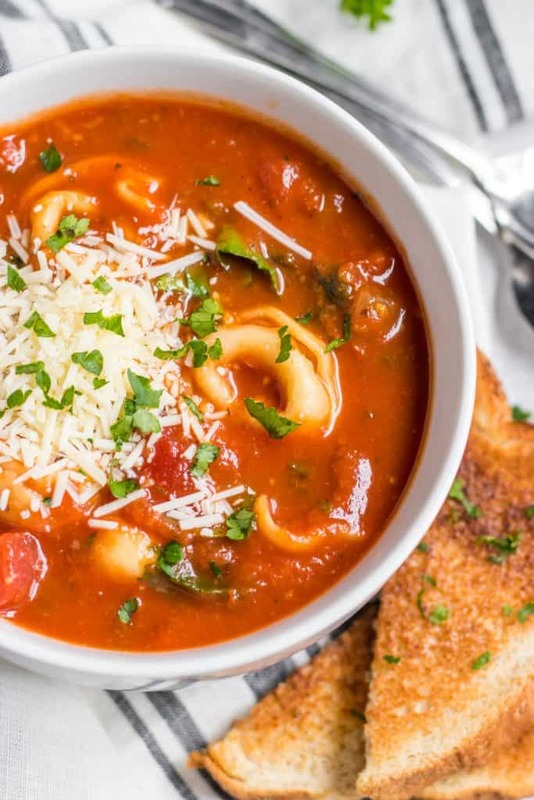 It’s the perfect pairing with this soup! Don’t overcook the tortellini. You will definitely want to wait until just before serving to add the tortellini for best results. 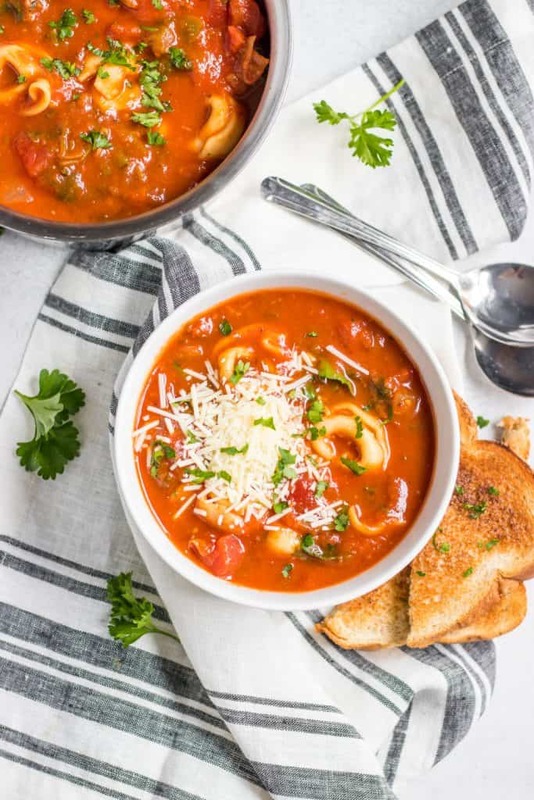 Other than that, this Tomato Tortellini Soup is cozy and delicious and sure to make everyone’s belly’s happy! 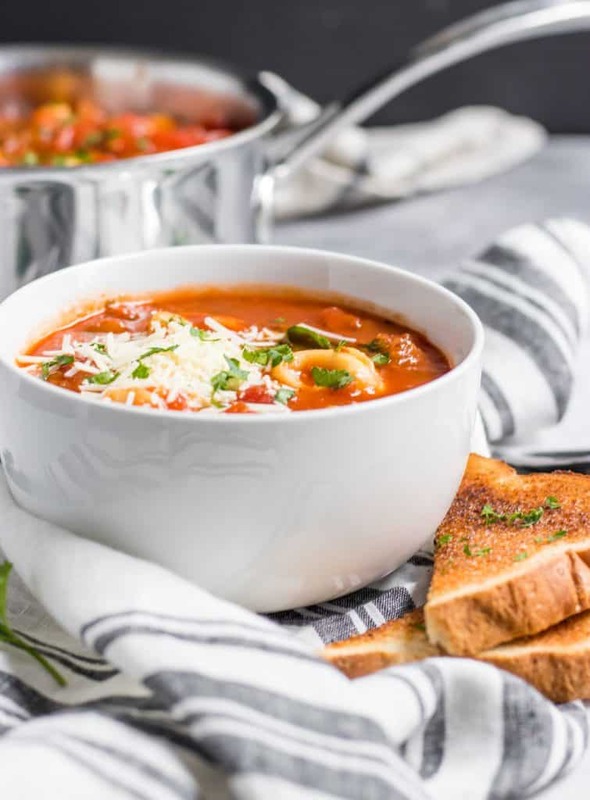 Looking for more cozy soups this season? Check them out here! Over medium high heat, heat olive oil. sauté onion until translucent. Add all other ingredients except tortellini. Heat over medium and bring to a light bubble for about 5 minutes stirring occasionally. Turn to low and allow to simmer for about 10-15 minutes. Several minutes before serving, add in tortellini and simmer until softened. Enjoy with fresh basil, garlic bread and your favorite shredded parmesan cheese! 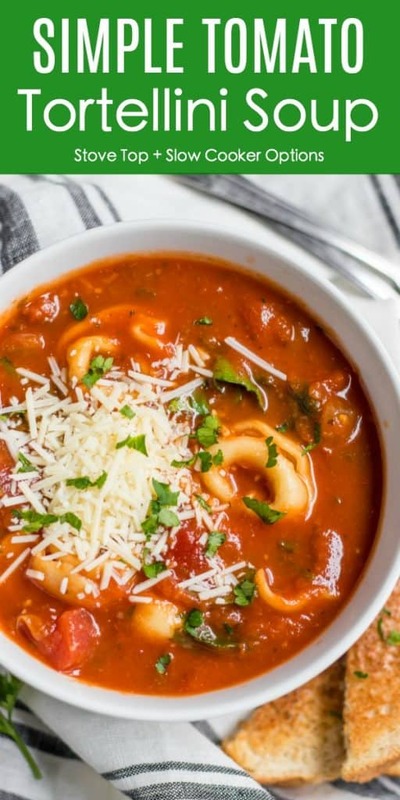 Combine all ingredients into slow cooker except for tortellini. Cook on low 4-6 hours or High 2-3 hours. Add in tortellini about 10 minutes before serving and allow to cook until al dente. Serve with your favorite garnishes! Plan on making this at least once a week from now on! Best soup I have made in a long time! This was the perfect weeknight dinner, thank you! Love hearing this! One of our latest faves! Ooooooh I’m sure that was INCREDIBLE. This looks delicious! And I have to say, as a dietitian who does have a medical condition where I’ve learned avoiding gluten makes a huge, huge, HUGE impact on my digestive health and quality of life, I still strongly encourage clients not to restrict gluten or anything unless they truly need to. In fact, there are often whole wheat versions of gluten-free goods that are packed with a lot more fiber and nutrients! 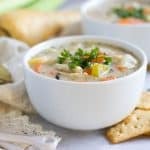 Man, I love a good soup and this one looks incredible! This looks incredible- I haven’t made something like this in a long time!